Balmain unveiled its Spring 2016 ad campaign and it’s the stuff marketing and social media dreams are made of. There is no stopping Olivier Rousteing! The campaign features Naomi Campbell, Cindy Crawford, and Claudia Schiffer, arguably three of the most famous supermodels of all time. This follows last season’s campaign with mods and “it” girls du moment Kendall Jenner, Joan Smalls, and Gigi Hadid shot alongside their also very well-known sisters. 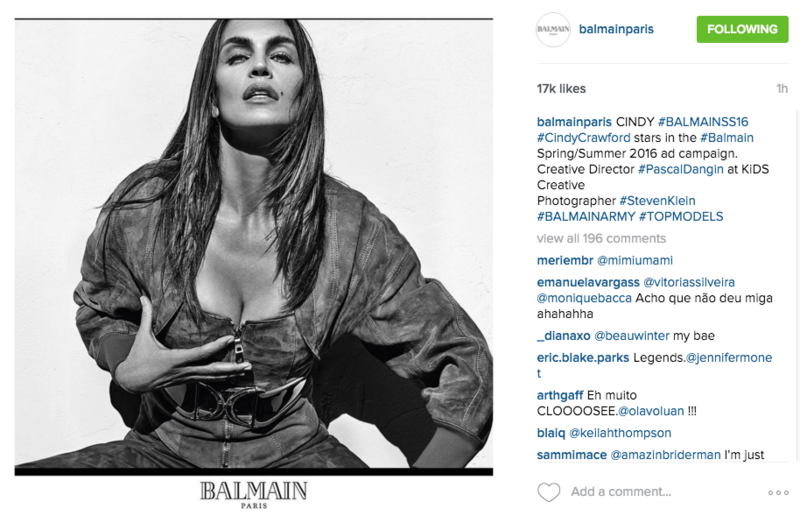 Shot in black and white by photographer Steven Klein with art direction by Pascal Dangin of KiDS Creative, the campaign is already garnering thousands of likes on Instagram (@BalmainParis), with the shot of Crawford grabbing her breast taking the cake at 17,000-plus likes at the time of this post. “While we shot these images, I had to smile as I imagined how my adolescent self would have reacted with utter disbelief if someone could have traveled back in time to tell me that one day I would be in a New York studio, watching Steven Klein shoot Cindy, Claudia and Naomi for my Spring 2016 campaign—for those four singular talents have inspired me from day one,” said Rousteing in a press release. “When I was a schoolboy in Bordeaux, it was their editorials that first made clear to me the amazing transformative power of fashion. Still today, many years on, their iconic images are often found amongst the jumble on mood boards in my (and almost every other designers’) atelier. To say that working with them was a dream come true is no exaggeration.” Rousteing also added that he hopes these images will one day be a part of an aspiring designer’s mood board, and no doubt they will. This supermodel trio is timeless.